For the practice of chewing the areca nut, see Paan and Betel. “Supari” redirects here. For the 2003 film, see Supari (film). The areca nut (/ˈærɪkə/ or /əˈriːkə/) is the fruit of the areca palm (Areca catechu), which grows in much of the tropical Pacific (Melanesia and Micronesia), Southeast and South Asia, and parts of east Africa. It is commonly referred to as betel nut so it is easily confused with betel (Piper betle) leaves that are often used to wrap it (paan). 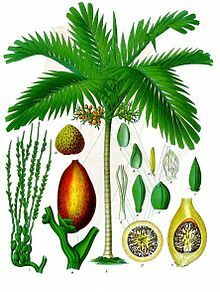 The term areca originated from the Kannada word adike (ಅಡಿಕೆ) and dates from the 16th century, when Dutch and Portuguese sailors took the nut from Kerala to Europe. Consumption has many harmful effects on health and is carcinogenic to humans. Various compounds present in the nut, including arecoline (the primary psychoactive ingredient which is similar to nicotine), contribute to histologic changes in the oral mucosa. It is known to be a major risk factor for cancers (squamous cell carcinoma) of the mouth and esophagus. As with chewing tobacco, its use is discouraged by preventive efforts. Consumption by hundreds of millions of people worldwide – mainly with southern and eastern Asian origins – has been described as a “neglected global public health emergency”. The areca nut is not a true nut, but rather a fruit categorized as a berry. It is commercially available in dried, cured, and fresh forms. When the husk of the fresh fruit is green, the nut inside is soft enough to be cut with a typical knife. In the ripe fruit, the husk becomes yellow or orange, and as it dries, the fruit inside hardens to a wood-like consistency. At that stage, the areca nut can only be sliced using a special scissors-like cutter. Usually for chewing, a few slices of the nut are wrapped in a betel leaf along with calcium hydroxide (slaked lime) and may include clove, cardamom, catechu (kattha), or other spices for extra flavouring. Betel leaf has a fresh, peppery taste, but it can also be bitter to varying degrees depending on the variety. Areca Nuts also known as “Betal Nuts” plants in Nepal. These types of nuts are commonly found in the Terai region of Nepal. The areca nut contains the tannins arecatannin and gallic acid; a fixed oil gum; a little terpineol; lignin; various saline substances; and three main alkaloids—arecoline, arecaidine, and guvacine—all of which have vasoconstricting properties. The betel leaf chewed along with the nut contains eugenol, another vasoconstrictor. Tobacco leaf is often added to the mixture, thereby adding the effect of nicotine. In parts of India, Sri Lanka, and southern China, areca nuts are not only chewed along with betel leaf, but are also used in the preparation of Ayurvedic and traditional Chinese medicines. Powdered areca nut is used as a constituent in some dentifrices. Other traditional uses include the removal of tapeworms and other intestinal parasites by swallowing a few teaspoons of powdered areca nut, drunk as a decoction, or by taking tablets containing the extracted alkaloids. According to traditional Ayurvedic medicine, chewing areca nut and betel leaf is a good remedy against bad breath. [unreliable source?] Diplomat Edmund Roberts noted that Chinese people would mix areca nut with Uncaria gambir during his visit to China in the 1830s. After chewing a betelnut, the red residue is generally spat out and is considered an eyesore. This has led many places to ban chewing this nut. Chewing the mixture of areca nut and betel leaf is a tradition, custom, or ritual which dates back thousands of years in much of the geographical areas from South Asia eastward to the Pacific. It constitutes an important and popular cultural activity in many Asian and Oceanic countries, including Pakistan, the Maldives, India, Nepal, Sri Lanka, Bhutan, Bangladesh, Burma (Myanmar), China, Laos, Thailand, Malaysia, Indonesia, Cambodia, Vietnam, Taiwan, the Philippines, Palau, Yap, Guam, Papua New Guinea, the Solomon Islands, and Vanuatu. How or when the areca nut and the betel leaf were first combined into one psychoactive drug is not known. Archaeological evidence from Thailand, Indonesia, and the Philippines suggests they have been used in tandem for at least 4000 years. In Vietnam, the areca nut and the betel leaf are such important symbols of love and marriage that in Vietnamese the phrase “matters of betel and areca” (chuyện trầu cau) is synonymous with marriage. The tradition of chewing areca nuts starts the talk between the groom’s parents and the bride’s parents about the young couple’s marriage. Therefore, the leaves and juices are used ceremonially in Vietnamese weddings. 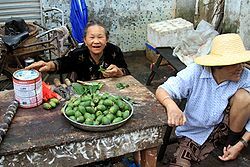 The folk tale explaining the origin of this Vietnamese tradition is a good illustration of the belief that the combination of areca nut and the betel leaf is ideal to the point they are practically inseparable, like an idealized married couple. Display of the items usually included in a chewing session: The betel leaves are folded in different ways according to the country and most have a little calcium hydroxide daubed inside. Slices of the dry areca nut are on the upper left hand and slices of the tender areca nut on the upper right. The pouch on the lower right contains tobacco, a relatively recent introduction. Malay culture and tradition hold betel nut and leaves in high esteem. Traditionally, guests who visit a Malay house are presented with a tray of areca nuts and betel leaves, in much the same way as drinks are offered to guests in many cultures around the world. There is even a Malay proverb about the betel nut, “bagaikan pinang dibelah dua“, loosely translated like a betel nut cut in two, usually used in the context of wedding to illustrate how perfectly matched the bride and the groom are. Areca Nut in small packs, usually labelled as betel nut in South India. In the Indian subcontinent, the chewing of betel and areca nut dates back to the pre-Vedic period Harappan empire. Formerly, in both India and Sri Lanka, it was a custom of the royalty to chew areca nut with betel leaf. Kings had special attendants whose duty it was to carry a box with all the necessary ingredients for a good chewing session. There was also a custom for lovers to chew areca nut and betel leaf together, because of its breath-freshening and relaxant properties. A sexual symbolism thus became attached to the chewing of the nut and the leaf. The areca nut represented the male principle, and the betel leaf the female principle. Considered an auspicious ingredient in Hinduism and some schools of Buddhism, the areca nut is still used along with betel leaf in religious ceremonies, and also while honoring individuals in much of southern Asia. In Assam, it is a tradition to offer pan-tamul (betel leaves and raw areca nut) to guests, after tea or meals, served in a brass plate with stands called bota. Among the Assamese, the areca nut also has a variety of uses during religious and marriage ceremonies, where it has the role of a fertility symbol. A tradition from Upper Assam is to invite guests to wedding receptions by offering a few areca nuts with betel leaves. During Bihu, the husori players are offered areca nuts and betel leaves by each household while their blessings are solicited. Spanish mariner Álvaro de Mendaña reported observing Solomon Islanders chewing the nut and the leaf with caustic lime, and the manner in which the habit stained their mouths red. He noted the friendly and genial chief Malope, on Santa Isabel Island, would offer him the combination as a token of friendship every time they met. The addition of tobacco leaf to the chewing mixture is a relatively recent innovation, as tobacco was not introduced from the American continent until the colonial era. Areca nut affects almost all organs of the human body, including the brain, heart, lungs, gastrointestinal tract and reproductive organs. It causes or aggravates pre-existing conditions such as neuronal injury, myocardial infarction, cardiac arrhythmias, hepatotoxicity, asthma, central obesity, type II diabetes, hyperlipidemia, metabolic syndrome, etc. Areca nut affects the endocrine system, leading to hypothyroidism, prostate hyperplasia and infertility. It affects the immune system leading to suppression of T-cell activity and decreased release of cytokines. It has harmful effects on the fetus when used during pregnancy. Habitual chewers of betel leaf and areca nut have a greatly increased risk of developing a range of serious diseases, including cancers of the mouth and esophagus. It has many systemic effects (see box). Use of areca nut has been associated with deterioration of psychosis in people with preexisting psychiatric disorders. Areca nut consumption is also tied to chronic kidney disease in men. In 2003 the International Agency for Research on Cancer (IARC), a World Health Organization sponsored group, found sufficient evidence that the habit of chewing betel quid, with or without tobacco, causes cancer in humans. Support for this conclusion is provided by a recent study which found that paan, even without concurrent tobacco use, is a risk factor for oral cancer. In October, 2009, 30 scientists from 10 countries met at IARC to reassess the carcinogenicity of various agents including areca nut, and mechanisms of carcinogenesis. They confirmed there is sufficient evidence that areca nut, with or without tobacco, can cause cancer. The harm caused by consumption of betel quid or areca nut by hundreds of millions of people worldwide (mainly with southern and eastern Asian origins and connections) has been characterized as a “neglected global public health emergency”. Chewing paan (and/or other areca nut and betel leaf formulations) during pregnancy significantly increases adverse outcomes for the baby. The habit is associated with higher incidences of preterm birth and low birth weight and height. Biologically, these effects may be a consequence of the arecoline that is found in areca nuts. The habit also exposes the fetus to various other toxic components linked to cancer. Sign in Indonesia saying that chewing betelnut is prohibited. Because of the mess, many places ban chewing betelnut. Notably, Port Moresby, the capital of Papua New Guinea, has a ban on buai. This buai ban is from Sentani Airport, Jayapura, Papua Province, Indonesia. Chewing betelnut produces a red residue which is spat out. It is often considered an eyesore. In India (the largest consumer of areca nut) and Pakistan, the preparation of nut with or without betel leaf is commonly referred to as paan. It is available practically everywhere and is sold in ready-to-chew pouches called pan masala or supari, as a mixture of many flavours whose primary base is areca nut crushed into small pieces. Poor people, who may eat only every other day, use it to stave off hunger pangs. Pan masala with a small quantity of tobacco is called gutka. The easily discarded, small plastic supari or gutka pouches are an ubiquitous pollutant of the South Asian environment. Some of the liquid in the mouth is usually disposed of by spitting, producing bright red spots wherever the expectorate lands. In the Maldives, areca nut chewing is very popular, but spitting is frowned upon and regarded as an unrefined, repulsive way of chewing. Usually, people prefer to chew thin slices of the dry nut, which is sometimes roasted. Kili, a mixture of areca nut, betel, cloves, cardamom and sugar is sold in small home-made paper pouches. Old people who have lost their teeth keep “chewing” by pounding the mixture of areca nut and betel with a small mortar and pestle. In Papua New Guinea and the Solomon Islands, fresh areca nut, betel leaf or ‘fruit leaf’ (daka in PNG) and lime are sold on street corners. In these countries, dried or flavoured areca nut is not popular. Betelnuts there are referred to in Tok Pisin as buai. There has recently been a controversial ban on selling and chewing betelnut in public places Port Moresby. Because of this, many people have tried to smuggle betelnut into Port Moresby. Notably, there was a raid in Hanuabada in May 2015 where several bags of betelnut were confiscated, the total value of the confiscated nuts exceeding $180,000 USD. Areca nut chewing has recently been introduced into Vanuatu, where it is growing in popularity, especially in the northern islands of the country. In Guam and the neighboring Northern Mariana Islands, betel and areca nut chewing is a social pastime as a means to extend friendship, and can be found in many, if not most, large gatherings as part of the food display. In Palau, betel nut is chewed with lime, piper leaf and nowadays, with the addition of tobacco. Older and younger generations alike enjoy the use of betel nut, which is readily available at stores and markets. Unlike in Papua New Guinea and the Solomon Islands, where the inner areca nut is used, in Palau, the areca nut’s skin is chewed along with lime, leaf and tobacco and the juice is not swallowed but spat out. In Taiwan, bags of 20 to 40 areca nuts are purchased fresh daily by a large number of consumers. To meet the steady year-round demand, two kinds of betel-nut shops sell betel and nuts, as well as cigarettes and drinks, including beer: Small mom and pop shops, often poorly maintained and with unassuming façades, and shops which will often consist of nothing more than a single, free-standing room, or booth. The latter is usually elevated one meter above the street, and measures less than 3 by 2 m. Large picture windows comprise two or more of the walls, allowing those who pass by a complete view of the interior. The interior is often painted brightly. Within such a shop, a sexily dressed young woman, a “betel nut beauty“, can be seen preparing betel and areca nuts. Shops are often identified by multicoloured (commonly green) fluorescent tubes or neon lights that frame the windows or that are arranged radially above a store. Customers stop on the side of the road and wait for the girls to bring their betel and areca nut to their vehicles. The habit of chewing betel nut is often associated with blue-collar labor industries such a long-haul transportation, construction, or fishing. Workers in these labor-intensive industries use betel nut for its stimulating effect, but it also becomes a tool for socializing with coworkers. For example, studies have shown chewing betel nut is prevalent among taxi, bus and truck drivers, who rely on the stimulating effect of betel nut to cope with long work hours. For these reasons, oral cancer has been identified as a leading cause of death in professions with high betel nut-chewing rates. In Hainan and Hunan Province, China, where Xiangtan is a center of use and processing, a wide range of old and young people consume areca nut daily. Most, though, consume the dried variety of the nut by itself, without the betel leaves. Some people also consume the areca nut in its raw, fresh form with or without the betel leaves. Betel nuts are sold mostly by old women walking around trying to sell it, but the dried version can be found in most shops which sell tea, alcohol and cigarettes. In Thailand, the consumption of areca nut has declined gradually in the last decades. The younger generation rarely chews the substance, especially in the cities. Most of the present-day consumption is confined to older generations, mostly people above 50. Even so, small trays of betel leaves and sliced tender areca nut are sold in markets and used as offerings in Buddhist shrines. In the Philippines, chewing the areca nut and betel leaf was a very widespread tradition in the past. Now, though, this tradition is almost dead among the urban people in the cities and big towns, and has largely been replaced by gum and tobacco. Nowadays, older people are the only ones chewing betel nuts. But in rural areas, betel nut-chewing is very much alive. In the United States, areca nut is not a controlled or specially taxed substance and may be found in some Asian grocery stores. However, importation of areca nut in a form other than whole or carved kernels of nuts can be stopped at the discretion of US Customs officers on the grounds of food, agricultural, or medicinal drug violations. Such actions by Customs are very rare. In the United Kingdom, areca nut is readily available in Asian grocery stores and even in shredded forms from the World Food aisles of larger Tesco supermarkets. Possession of betel nut or leaf is banned in the UAE and is a punishable offense. Places such as Guwahati (গুৱাহাটী) in Assam (অসম), Penang in Malaysia, Ko Mak (เกาะหมาก) in Thailand and Fua Mulaku in Maldives have been named after the areca nut. ^ Merriam-Webster, Merriam-Webster’s Collegiate Dictionary, Merriam-Webster. Additional information: Cognates include Kannada adike/ಅಡಿಕೆ, Malayalam adakka/ataykka, and Tamil adakkai. ^ “Modern herbal”. Botanical.com. Retrieved 2014-06-10. ^ a b “IARC Monographs Programme finds betel-quid and areca-nut chewing carcinogenic to humans”. World Health Organization. 2003. ^ a b Bhat, R.; Ganachari, S.; Deshpande, R.; Ravindra, G.; Venkataraman, A. (2012). “Rapid Biosynthesis of Silver Nanoparticles Using Areca Nut (Areca catechu) Extract Under Microwave-Assistance”. Journal of Cluster Science. 24: 107–114. doi:10.1007/s10876-012-0519-2. ^ Roberts, Edmund (1837). Embassy to the Eastern Courts of Cochin-China, Siam, and Muscat. New York: Harper & Brothers. p. 138. ^ “Archaeological evidence from Thailand, Indonesia and the Philippines”. Epistola.com. Retrieved 2014-06-10. ^ “Vietnamese Legend”. Vietspring.org. Retrieved 2014-06-10. ^ “Betel chewing”. Singapore Infopedia. National Library Singapore. May 5, 1999. Archived from the original on October 15, 2008. ^ a b c d e Garg A, Chaturvedi P, Gupta PC (January 2014). “A review of the systemic adverse effects of areca nut or betel nut”. Indian Journal of Medical and Paediatric Oncology. 35 (1): 3–9. doi:10.4103/0971-5851.133702. PMC 4080659. PMID 25006276. ^ a b c Javed F, Bello Correra FO, Chotai M, Tappuni AR, Almas K (December 2010). “Systemic conditions associated with areca nut usage: a literature review”. Scandinavian Journal of Public Health. 38 (8): 838–44. doi:10.1177/1403494810379291. PMID 20688790. ^ Maher, R.; Maher R; Lee AJ; Warnakulasuriya KA; Lewis JA; Johnson NW. (1994-02-23). “Role of areca nut in the causation of oral submucosal fibrosis: a case-control study in Pakistan”. Journal of Oral Pathology and Medicine. 23 (2): 65–9. doi:10.1111/j.1600-0714.1994.tb00258.x. PMID 8164155. ^ Ernst, E. (1998). “Harmless Herbs? A Review of the Recent Literature”. American Journal of Medicine. 104 (2): 170–178. doi:10.1016/S0002-9343(97)00397-5. PMID 9528737. ^ Chou, Che-Yi; Cheng, Shi-Yann; Liu, Jiung-Hsiun; Cheng, Wen-Chun; Kang, I.-Min; Tseng, Yu-Hsiang; Shih, Chuen-Ming; Chen, Walter (2009-05-01). “Association between betel-nut chewing and chronic kidney disease in men”. Public Health Nutrition. 12 (5): 723–727. doi:10.1017/S1368980008003339. ISSN 1368-9800. PMID 18647430. ^ See table for Group 1 carcinogen agents in Beatrice Secretan; et al. (2009). “A review of human carcinogens”. The Lancet Oncology. 10 (11): 1033–1034. doi:10.1016/S1470-2045(09)70326-2. PMID 19891056. ^ Mehrtash H, Duncan K, Parascandola M, David A, Gritz ER, Gupta PC, Mehrotra R, Amer Nordin AS, Pearlman PC, Warnakulasuriya S, Wen CP, Zain RB, Trimble EL (December 2017). “Defining a global research and policy agenda for betel quid and areca nut”. Lancet Oncol. 18 (12): e767–e775. doi:10.1016/S1470-2045(17)30460-6. PMID 29208442. ^ Kumar, S (April 2013). “Tobacco and areca nut chewing—reproductive impairments: an overview”. Reproductive Toxicology (Elmsford, N.Y.). 36: 12–7. doi:10.1016/j.reprotox.2012.11.007. PMID 23207167. ^ Collingham, Lizzie (2006). Curry: A Tale of Cooks and Conquerors. Oxford: Oxford University Press. p. 7. ISBN 978-0-19-988381-3. ^ Chuang CY, Chang CH, Chang CC. The workplace relevant factors of betel quid chewing among transportation workers in Central Taiwan (in Chinese). Taiwan Journal of Public Health 2007; 26: 433–42. ^ Kuo SC, Lew-Ting CY. The health lifestyles of areca quid-chewing taxi drivers – an exploratory study from the viewpoint of social context (in Chinese). Taiwan Journal of Oral Medical Science 2008; 27: 67–80. ^ “Banned substance Betel Nut readily available for sale in Australia”. SBS.com.au. Retrieved 2 July 2018. ^ “Avoid bringing banned items into the UAE”. www.dubai.ae. Retrieved 2017-10-13.